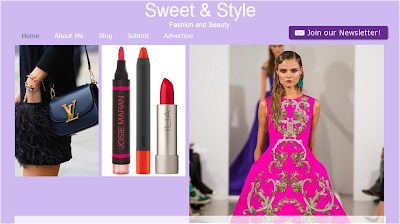 I want everyone to check out Sweet & Style! It is run by this awesome girl who wants to helps bloggers like me. Being a blogger is hard, especially when you check your account everyday only to see that no one has viewed your posts or the number of followers haven't changed in over a month. It can be a little disheartening. Sooooo Gabby has created this website dedicated to sharing the blogs of small, lesser known bloggers. Just to get the word out!! So do me a favour and check out my 'Green Sparkles' post on her site. And while your there check out some of the other cool bloggers out there.